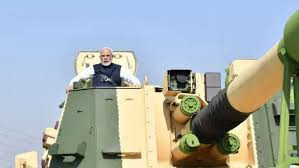 Prime Minister Narendra Modi inaugurated the country’s first armored system complex (ASC) built by a private company at Hazira in Surat last month. The private firm, Larsen & Toubro (L&T), started manufacturing the K9 Vajra Self Propelled Howitzer guns at the complex after it won the Rs 4,500-crore contract from the Ministry of Defence two years ago to supply 100 units of K9 Vajra-T 155 mm/52 calibre tracked self-propelled gun systems to the Indian Army under the Centre’s ‘Make in India’ initiative. “I congratulate the entire team of Larsen & Toubro for building the state-of-the-art K-9 Vajra Self Propelled Howitzer. This is a significant contribution towards India’s defence sector and protecting the country… Boosting ‘Make in India’ in the defence sector is our endeavour. I am glad that the private sector too is supporting this pursuit and making a valuable contribution,” the Prime Minister tweeted after the inauguration. He, however, did not address people at the inauguration. Modi also shared a short video on his Twitter handle of himself seated in a tank. “Checking out the tanks at L&T’s Armoured Systems Complex in Hazira,” he wrote. Defence Minister Nirmala Sitharaman and A M Naik, Minister of Defence Acquisition of the Republic of Korea Wang Jung Hong and L&T Group Chairman A M Naik were present on the occasion. L&T, which has signed a transfer of technology contract for guns with South Korean company Hanwha Corporation, set up the facility to manufacture and integrate advanced armoured platforms, such as self-propelled artillery Howitzers, future infantry combat vehicles, future-ready combat vehicles and future main battle tanks. Last August, the company handed over 10 units of K9 Vajra-T Howitzer guns to the Army.